For most medieval princesses, it was inevitable they would end up as a pawn in a diplomatic game. This was certainly true for Joan of the Tower who would become a party to the union of the youngest royal couple to be married in Scotland and England. David, the son of Robert I (Robert the Bruce) was four years, four months and thirteen days old and Joan was seven years, twelve days old at the time of the marriage. Joan was also taken from home and her mother at this young age. Joan was born on July 5, 1321 in the Tower of London. She was the daughter of King Edward II of England and Isabella, daughter of King Philip IV of France. Nothing is known of Joan’s early life. She was the last child of the queen and at the time of her birth, Queen Isabella had grown resentful of her husband’s favorites and his treatment of her. Discussions of a marriage for Joan began when she was four years old. The first prospect was the son and heir of the King of Aragon, Jaime II and then Philip, Count of Valois (later King Philip V) was a prospect. However, neither of these marriages materialized. In 1327-28, Joan’s mother Queen Isabella and her lover Roger Mortimer deposed her father King Edward II and began ruling as regents for Joan’s brother King Edward III. The couple wanted to pursue peace with Robert I of Scotland. The Battle of Bannockburn in 1314 had not ended the war between England and Scotland. King Robert saw this as an opportunity to realize his most significant objective. He insisted that his status as King of Scots be recognized and that England renounce all claims of sovereignty over Scotland, something King Edward II had refused to do this during his reign. It was not until March 1, 1328 that Edward III issued letters patent recognizing Robert the Bruce as King of Scots and establishing the border between the two countries as it was during the reign of Alexander III. In order for England to abandon this position, which they had held since 1291, Scottish friendship had to be assured. English envoys started negotiating a marriage between Joan and Robert I’s son and heir David, born to his second wife Elizabeth de Burgh. All parties were counting on this marriage to guarantee Scotland’s friendship. Because of the youth of the two children, the marriage would not be truly valid until David reached the canonical age of marriage at fourteen in 1338. To cover this, the treaty contained a provision that if the marriage was not completely validated and consummated within two months of David turning fourteen, the concessions of the treaty were null and void. If Joan were to die before the wedding, Edward was obliged to find a replacement. If David died, Joan would marry the next son and heir instead. The Scots were to assure Joan had property with revenue of £2000 per annum. The treaty did not discuss a dowry for Joan. If the wedding was not consummated by Michaelmas 1338, King Robert was to pay an enormous penalty of £100,000. The English feared the Scots would back out of the marriage which they could certainly do before David reached marriageable age. The Treaty of Edinburgh-Northampton was finalized and signed on March 17, 1328 in the King’s Chamber at Holyrood where King Robert lay ill. It was ratified by the English on May 3 at Northampton. Queen Isabella and Joan travelled to Berwick where Joan and David were formerly married on July 17 in the church there. Queen Isabella attended the wedding but Edward III inexplicably was not there and Robert I claimed illness and was absent. However, it was a grand occasion because King Robert spent £2500 on the festivities. After the wedding, the couple were taken to Cardross to see King Robert. Some of Joan’s ladies returned to England while Joan stayed in Scotland to live with her husband. King Robert died on June 7, 1329 rendering David king and Joan queen. A double coronation took place at Scone Abbey on November 24, 1331 with James Ben, Archbishop of St. Andrews presiding. At the time of the ceremony, David was too young to realize the significance of the event. He was the first Scottish king to be both anointed and crowned due to the Pope having just recognized Scotland as a separate sovereign state, granting the king the right to be formally anointed. A new crown and small scepter were made for the occasion. Joan was also the first queen to be formally crowned and anointed as consort. Nothing is known about Joan’s life in Scotland for the first six years. Because of David’s youth and his rule being subject to a regency, there were others who wanted to seize the throne. Joan’s brother Edward was dismayed and unhappy his mother and Mortimer had completed the Treaty of Edinburgh-Northampton in his name. People had given Joan a new soubriquet “Joan Makepeace” which Edward considered derogatory. Edward ousted his mother’s lover Roger Mortimer and had him executed in November 1330. He was now in control of his own government and used the minority of David II as an opportunity to interfere in Scottish politics. 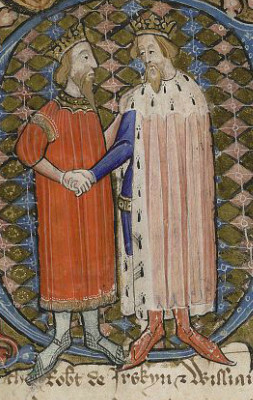 Within a year of David and Joan’s coronation, the former King of Scots John Balliol’s son Edward was claiming to be king with the support and assistance of Edward III. Edward was banking on Balliol accepting his over-lordship of the Scottish kingdom. Balliol engaged David’s army at the Battle of Dupplin Moor near Perth on August 12, 1332 and Balliol defeated the royal forces and was crowned at Scone on September 24. Balliol suggested to Edward III that he marry Joan assuming her current marriage could be annulled before it was consummated. Balliol was probably in his fifties at the time so nothing came of this suggested union. Balliol’s hold on the throne was tenuous and forces gathered in the name of King David surprised Balliol in a night raid and he was forced to flee over the border into England. Edward III intervened by taking an army north and won the Battle of Halidon Hill on July 19, 1333. Because of Balliol’s threat to David II’s position, David and Joan were removed from Dumbarton Castle in 1334 and taken to France for safety at the invitation of King Philip VI, Joan’s mother’s cousin. Philip gave them accommodations in Château Galliard in Normandy where they lived quite well for the next seven years with several Scottish attendants. Balliol never gained enough authority to hold onto the entire Scottish kingdom and eventually fell from power. Joan and David returned to a warm welcome in Scotland in May of 1341. David was unprepared to rule his kingdom and found there were lords and nobles who had even more dominion than he did as king so it was rough going. When Edward III won the Battle of Crécy in France in August 1346, David was obliged to invade England in support of his ally of France, according to the terms of the Auld Alliance from 1295. The Battle of Neville’s Cross on October 17, 1346 was a humiliating defeat for David with many Scottish nobles dying and David himself being taken prisoner. David was kept in captivity for the next eleven years, spending some time in the Tower of London and a great deal of time at Hertford Castle. He had one short stay in Scotland in 1351-2. It is unclear if Joan remained in Scotland, stayed in England or divided her time between the two countries. She may have stayed mostly in Scotland possibly as a hostage for David’s security. 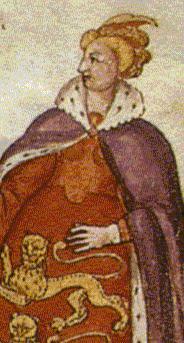 David’s nephew Robert ruled as Steward of Scotland while he was captive. David never liked Robert but he was his heir. Even though Joan and David were married for over thirty-five years and obviously had sexual relations, there was never any evidence Joan became pregnant. January 17, 1357, the Scots sent ambassadors to England to negotiate the return of their king. In August the preliminaries were agreed upon and the terms were ratified by the Scots Parliament. Joan does not appear in any of the documents regarding the discussions for David’s release. The Treaty of Berwick was finalized in November. David was to return to Scotland in exchange for a payment of 100,000 merks which was spread out over ten equal installments. This was never fully paid. On Christmas Day, Joan, the Bishop of Andrews and Earl of March received safe conducts to go to England to organize the first installment of the ransom. David’s return precipitated a crisis in his relationship with his wife. As a captive, David had taken a mistress by the name of Katherine Mortimer and apparently was deeply in love with her. For all intents and purposes, Joan and David severed their relationship and Joan would spend the rest of her life in England. King Edward gave Joan a pension of £200 per annum. Katherine Mortimer was murdered in Soutra, Scotland in the summer of 1360 by being stabbed at the instigation of jealous Scottish lords. David then took up with Margaret Drummond, the daughter of Sir John Drummond and the widow of Sir John Logie. In September of 1356, the Prince of Wales, son of Edward III won a resounding victory at Poitiers in France and captured King John II and his son along with much of the French nobility. 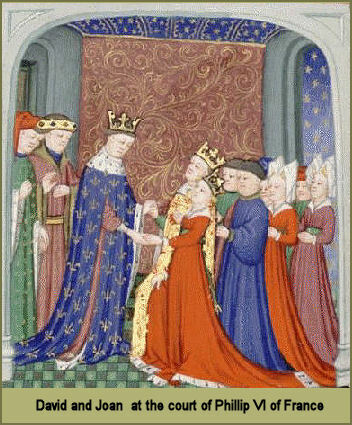 Peace was made between England and France in March, 1357. On May 5, the Prince of Wales landed at Plymouth with the captive king. A series of tournaments and celebrations were planned. The greatest of these was a tournament held at Windsor on St. George’s Day 1358. Joan attended the Windsor Tournament along with her mother. A contemporary chronicler described Joan as sweet, debonair, courteous, homely, pleasant and fair. After the tournament, Joan nursed her sixty-six year old mother who was ill. Queen Isabella died on August 22, 1358. By 1362, the payment of Joan’s pension was running far in advance, indicating the amount was inadequate to cover her expenses. Joan died on September 7, 1362 at the age of forty-one while visiting her brother at Hertford Castle. She was interred in the church of Greyfriars in London where her mother had been buried. About a year later, King David married Margaret Drummond.